I recently purchased a refurbished Tamron 24-70 mm F2.8. I have used it a couple of times. When I sucked in the files to LR, and went to turn on "Lens Profile", what gets filled in is the profile for the Sigma 24-70 F2.8. I went to the drop-down list, blindly selected "Tamron", and all the display remained. Does this mean LR really has the profile for the Tamron, but the lens isn't transmitting to LR, or is LR just faking it? I have an older Canon lens, and when I use it, nothing shows up in the boxes, meaning LR doesn't have the profile data. Anyone know the answer, as long as you can figure out what I mean? Hi - the profile was added in Version 4.1 (I have 5.7). But I still wonder why it doesn't automatically come up. 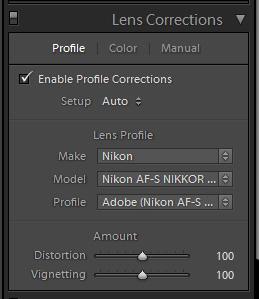 In the Lens Corrections Tab, just check 'Enable Profile Corrections' obviously, but under the drop down menu of 'Setup' choose 'Auto' for detection and you should never have to look for a specific lens used again. I am still using v4.5 of LR, don't need the updates since I only ever do WB and Exposure corrections in there so there should still be an 'Auto' choice. If you have those selected then obviously it's because it's a '3rd Party' lens type and it only looks for your camera manufacturer's automatically and when it detects nothing, just ignores, I presume. Hi, Trev - I just tried this. When I put Setup in "Auto", it selects the Sigma 24-70 F2.8. I can then go into the "Make" dropdown and select Tamron, the "Model" changes to Tamron 24-70 F2.8 A007E, and the "Profile" changes to Adobe (Tamron 24-70 ......). The "Setup" then changes from Auto to Custom when I do this. I have a Sigma lens for my Canon 600D, and LR has always automatically detected it, so I'm assuming it doesn't have anything to do with 3rd party stuff. I don't know, just a curious thing. The lens works great, I got it for a great price because it was a refurb. Just seems like some piece of info isn't making it out of the lens correctly if at all. At least you have it showing up, now test by loading an image not shot by the Tamron, then go back to the one with Tamron and see if it will then remember the setting. Also, once you have it set up, why don't you do a 'Preset', so when importing have it embedded in a Preset you may use, just a thought. Trev - good suggestions. I'm lacking on my presets, and one of these days I will get a couple going. I know they are time savers.